After reading lines like that I thought it was a bit too good to be true, but still emailed the owner for more information. After stopping by to see the booth, how it worked, and ironing out a few more details, I felt comfortable this was a legitimate business. Not only did the owner have payment records for the year (in which he made $37,000 gross in 2011), he also seemed motivated to get rid of it since he was moving out of state and I was the only interested party. Running a booth is a piece of cake once you get the basics down, but the hardest part of the business is getting noticed. So if you’re good at marketing you’ll do well. Does it Require Technical Expertise? A little bit of familiarity with camera settings such as ISO, shutter speed and aperture definitely help, but once you know the basic settings you’ll use at events it really doesn’t change much. You can practice these settings in your living room to get comfortable before working your first event. I practiced on friends and myself for hours to get comfortable. You’ll also have to learn a software program and know how to hook everything up, but after a few hours it’s pretty easy to master. Once you’ve got that down you literally just stand at the event, talk to people, babysit the booth to make sure it doesn’t run out of paper, make sure the guests are behaving, and overall ensure everyone is having a good time. Freedom to decide when you want to work is a big one. In the winters I often turn down events simply because I don’t want to work them, or if I have plans for a certain date I simply email the person back thanking them, but saying we’re booked.Then of course the biggest benefit is the money. I typically make $100 an hour gross profit before taxes are accounted for. If I work two events in a weekend it’s quite easy to make $1,000. This is all received before I even show up to the event as I require a deposit to hold the date, and then payment in full before the day of the event. I used to bartend and work the same hours, and would be happy if I made $200 a night. The photo booth allows me to make upwards of three times that much and do a lot less physical work. I also created a Solo 401k so that I can funnel a lot of my side business income tax free for retirement. The vast majority of events I work are Friday and Saturday nights in the summer ,which means it definitely digs into your social life. Booths at weddings are huge, so you also have to deal with some drunken idiots at times, especially the guys who like to occasionally take off their pants and snap a picture of their you know what. (Editor’s note: My friends are these people he’s talking about, haha… Personally, I prefer to go the photobomb route ;)). It seems that the biggest hassle is playing the role of bouncer and reminding people to behave. During the events since there are often a lot of drunk people I also have to constantly be watching the booth to make sure nobody is tipping it over or doing anything that could damage it. Another downfall is that you’re at the mercy of obtaining leads, which for me are mostly based on my . If you don’t know how to market the business online, you’re probably not going to do well. But since I know a fair amount about building websites and getting a decent ranking, it has helped my business a lot. SEO is probably the most important marketing activity you can do. If you don’t know SEO, hire someone or use Google Adwords to pay for clicks. But all that will cut into your profit margin. If you’re at an event with a photo booth, start talking to the person there and ask them if they can show you how it works and give you any pointers. Other than that, I would call photo booths in your local market to get a general idea of how booked up they are, and the average price they’re charging so that you can create a basic business plan to see if you’ll be able to turn a profit. Likewise if you’re building a booth from scratch, search Craigslist to find anyone getting out of the business , or to find your equipment such as your printer, camera, or laptop used for a cheaper rate. If you’re willing to sacrifice your weekend nights in the wedding season, aren’t afraid of peer pressure from drunk people, and have a few thousand to invest in to get it up and running, a photo booth is a great way to make some decent money and pay off chunks of your bills each month. Ryan blogs about photography over at where he shares a more detailed article on for those interested. PS: You can find all 46 other hustles we’ve listed so far here. And if you have one of your own you’d like to share, you can shoot that my way here. Thanks! I’m not much of a photographer but it seems like it might be a nice business to scale even, paying a young photographer a couple hundred bucks to run the booth and saving up for multiple booths. Since you get paid up front it might be pretty simple. And it could free up some nights, although it adds some management of people to your plate. I’ve thought of this a bit. However, the biggest issue is transporting the booth. It works if you have a large truck and drop off the booths before the event and pick up after, but if you don’t have a large vehicle and if the events are spaced far apart in terms of distance and time slots, it doesn’t flow very well. The other option is to have your employees use their own vehicles (which would need to be fairly large), and then of course there are insurance and trust issues with that. At this point I have too many other projects to try to build up the photo booth business and make it scalable, but it’s a nice side income with high margin. Nice shark tank reference J! Nice gig! I definitely get that dealing with drunk people all the time is probably annoying as hell, but I’m guessing you get some pretty good stories out of it too! We attended a Holiday part in January and there was a photo booth set up. A single man operation, basically set up and break down of the gear. The guy had a bunch of props, hats, etc that you could ware for you photos if you wanted. Lots of interests during the party for the photo booth. The props totally make it more fun too! Engagement is always good. Yes, the more ridiculous the better. Everyone opens up a lot more if they have goofy props. We are currently selling our photo booth. Just bought it 4 months ago and it was used on 3 events. Unfortunately, it needs a person that would be able to attend the photo booth, and its been very difficult for me. So, I am looking to sell the photo booth, if you know of anyone, kindly let me know. Margie (215) 609-0634, thanks. Have you sold your Photo booth? Did you ever sell your photobooth? I shot Margie an email and she confirmed that she did indeed sell it . That’s a pretty fun side hustle! Sounds like a fun hustle! It seems like just about every wedding has a photo booth these days, so I can see how you must keep busy during wedding season. its a great money maker. just a few weekends a month and I have just paid off my car. Sounds like a great hustle. I’d probably pay a college student to do it for me though! A good idea, but man – I’d be worried about the equipment the whole time :( You’d have to find someone you really trust and is good about that stuff, which I’m sure you could. Yea, I’ve had a few friends work events, but the biggest issue is transporting the booth (who’s vehicle do you use? ), and trusting them to not break anything (the printer alone costs a grand). If you trust someone and have time to train them and they know a bit about photography, may be worth a shot. Great side hustle! I know photo booths have become a big deal here in Houston. Good luck at continued success! Wow, that’s a solid sideline gig! That is also sweet that you worked out a way you could buy the business that wasn’t all cash. I’ve been to several events where the photo booth wasn’t even staffed at all, but I guess it would depend on the event and booth style. Yea the booth style would play a big role. When I’m working events I don’t keep my eye off the booth because people get pretty rowdy. They start leaning on it, spill a drink in it, etc… so it’s pretty trusting to leave it unattended (at least at a late night evening gig). That’s crazy. I had no idea they could bring in that much money. My best friend recently had one at her wedding and it was probably the biggest hit of the evening. It seems like a business that has staying potential. I hope so :) So far people ing me has been a pretty steady stream. As a small, young lady, I don’t know if I could deal with the drunkies. I’ve been harrassed enough times to keep far away from those kinds of situations. This is something that we have actually been thinking about. We know of someone who personally does this, and it seems like a good way to make some money. Once you get the hang of it, it’s pretty easy. If you have any questions, feel free to email me. You could own the spot! I have to agree pretty cool side hustle. Good luck in 2014. I think you just discovered my dream job. ; ) That sounds like a cool gig. I love photo booths. I even devoted a whole board to them on Pinterest. I’m no photog, but my wife is. Definitely something I’m going to do some more research into! I just started this a couple of weeks ago using my Nikon D3000, an Epson printer and a backdrop. I booked my first corporate event and it was awesome! Started my photobooth about 5 months ago and been totally worth it. A bit of an investment to start but believe me you recoup your money in very little time. Upside, you get to meet loads of people, big parties, nice food lol and if lucky meet some celebs. Downside: if you dont mind loosing your saturday and friday nights then you should be fine. Planning to leave my day job soon because i cant cope with orders working 9 – 5. Totally worth it. Super excited! How do you advertise? Or where? What are the most used props? Any flyers I can get ideas from? I just opened my photography business back in march of 2014, and I just booked my first large event. They requested a photo booth, and I told them I will make it happen… I have all the props and am getting the back drops soon, but my question is about the dye sub printers… I have an iPad air, and was hoping to use that for taking the pictures, so I can keep my professional camera to use to take pics of the party. I have researched tons of printers but none seem to say mac or iPad comparable.. I am really interested in the mitsubishi and the DNP8 as I would love one that prints out 8×10’s..
coukd write a book about Photobooth parties!! hey i’m reallllllly interested in starting this business I just wanted to know how much to spend on the overall booth and its technology. I recently saw a really good Photo Booth on a site that was $9950 all inclusive of camera equipment and pod booth. does this sound realistic. what sort of price should i be looking at to start the business. I’m also considering starting a photo booth business and since I’m not handy, I’m going to buy one. Any ideas on booth vs. open air models? Any thoughts on lighting? Some say strobe is the way to go. Thanks ! hi there, first off…thank you! this information has been so useful. this business is something im starting on my own as well and have no clue where to begin. im not sure of the quality and comparison upon the different supplies to purchase. do you have any recommendations of bigger bang for the buck, cameras, printers, booth style set ups, etc? the internet has so many options, but it would be nice to hear it from someone in the industry. thanks again so much. i look forward to hearing from you back. Great read.. I started my photo booth rental company in 2011. I quit my job day job of 11 years to pursue the business full time. It was the best decision of my life. When I first started the concept of a portable photo booths was still new. So we had to be innovative and build our own. Actually I paid someone to do it for me because I simply did not know the process or even touched a electric saw in my life. I bought everything piece by piece. Wired everything together. Figured out how breeze DSLR remote pro worked and read the manual over and over again. We even made our own velvet curtains from scratch. 2 years in the business we were doing more than 20 events in a day. Being that busy is not always a good thing. It comes with a lot of sacrifice and no sleep. I’ve scaled down to a cofortable level since then and pick and choose events that we want to do. Much has changed since then and now photo booths are becoming the norm at every event. The style of photo booths have evolved and the technology is a lot better. For those who have been in the industry for awhile will need to change or be left behind. For those wanting to get started. My advice is just to GET STARTED. Write out a plan or even a list and start executing that plan. I started with a box, then I bought a printer, etc etc. Do anything that will make you move toward that goal of owning a booth. There are definitely a lot of options out there. Just do your due deligence and read and research so you can find something that fits your needs, taste and personality. Great read!!! Thanks a lot for this. I’m in the process of researching about photobooths, but I got my answer now. Thanks once again for the great infor here everybody!!!!! Did u ever start the photobooth if so how did it go. One thing I would like for you to take away is when you purchasing a photo booth make sure it is easy for you to setup and use (weight less than 50 lbs). Purchase from a company that has outstanding customer service. Check out Minbooth.com or ShutterQue.com and tell them Jackie from NYC sent you. They are amazing and will help you with each step. See if you could purchase the Shell (photo booth housing). You don’t need the items inside because you might have that in your house already. You might have cables, strobe lights, or a tablet already. If not, then purchase the entire setup and you will be fine. hmmmm, per my research, there seems to be a proliferation of such companies in every single major metropolitan area of this country. 100s of websites and companies for rent or sale of photo booth. This market cannot be that hot, I feel a lot of these guys will go bust very soon, its getting cutthroat and there are too many hands and all too often low quality performance from the smaller players. I cannot imagine there is so much demand to buy a few thousand dollar piece of entertainment equipment for 100s of entities to be selling it claiming the good ole MAKE HUNDREDS OF DOLLARS AN HOUR with just one invest and no skills. People need to know when to jump ship. Thought I’d jump in to the discussion here. As several posters mentioned, the photo booth category is popular and has been since around 2007. Forbes just posted an article that showed a Google trends chart from 2009-2016 which reflected that searches for ‘photo booth rental’ outpaced searched for ‘DJ rental’ and ‘wedding photographers.’ There has been an upward trend line for ‘photo booth rental’ and is both a great side business and full-time business. Thanks for chiming in, y’all! Love seeing the discussion keep going here over the years… Please keep sharing real life experiences for all those out there hustling! It’s super helpful to those of us researching it! Photo booths are definitely a great side hustle! If you’re someone who enjoys your your weekends however, as you’ve stated, losing your weekends to gigs will be a huge bummer! Also another understated road bump for newbies is the learning curve for software and technical difficulties. In the middle of events it can be stressful if your equipment fails (it will fail eventually). But if you know how to troubleshoot and can keep calm under pressure, you’ll thrive and won’t want to throw your photo booth out the window after your first event! hi Guys, i started a photo booth business after reading this article and the comments. I need some help/advice on how to get events in Hartford Connecticut area. If anyone also has gigs they want to offload please reach out to me. I’m willing to travel to NY/Boston if need be. congrats! hope it goes well for you! Hi! Awesome article. Thanks for shedding some light into the phot booth business. I am considering opening a photo booth of my own and was wondering if you could tell me the average cost of printing per event. I saw on a previous article of yours that it would cost approx. $200 for 4 events (paper and ink included). How many strips do you typically print per event? Thanks! 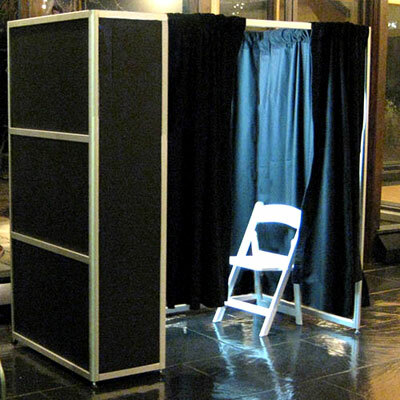 This is an open-air photobooth with equipment, case, software, backdrop stand, backdrops and props. Everything you need to run your own Photobooth Business! Definitely a fun money maker!!! Next post: What if we only bought the stuff we loved?